"Can Jesus be considered to be at the origin of Christianity? Can he be said to be have founded the Church?" 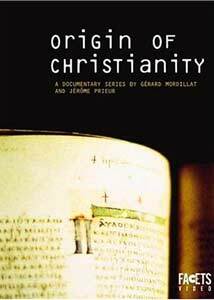 Origin of Christianity is a sprawling, nearly 10-hour, four-disc documentary, made in France, from Gerard Mordillat and Jerome Prieur, who together penned a French bestseller entitled Jesus After Jesus. To assemble Origin of Christianity, Mordillat and Prieur spent nearly four years interviewing a number of leading historians, archeologists and assorted religion experts to not just dissect and examine the beginnings of Christianity (hence the title), but to further dig into such potentially volatile issues as whether or not Jesus had siblings, who exactly founded the Church, is Jesus God, and attempting to explain the relationship between Judaism and Christianity. The project begins in episode one with the death of Jesus, and leads on through the eventual division of Judaism and Christianity by the time the tenth episode is done. While the subject has the potential to be engaging and maybe even controversial, this is unfortunately dry, high-brow stuff consisting nearly entirely of talking head interviews from assorted scholars, connected by an eerily robotic female narrator. There is little in the way of casual ramp-up for those with a marginal knowledge, and the content starts out heavy and retains that pace for all 10 of the 48-minute installments. Mordillat and Prieur do, however, provide occasional definitions that pop up on the bottom of the screen, explaining terms or locations that may or may not be common knowledge outside scholarly circles. There was a frustrating level of emotional disconnection, at least for me, with the presentation of Origin of Christianity, and while there is no disputing the brain power and knowledge base of the participants, it is a challenging project to simply wade into. Even though the visual element is very static, this is hardly the kind of documentary you can listen to while you fold laundry, and even if you pay close attention the non-stop flow of information is so great that it often becomes tough to digest one concept before another equally meaty chunk gets lobbed out. I consider myself a somewhat open-minded, science-loving evolutionary agnostic, but I had a really tough time staying focused on the material. I'll admit that it seems like a cheap shot for me to simply discount Origin of Christianity simply on the presentation, because it is clearly a well researched and assembled project. But it reminded me of a college lecture where no matter how hard you wanted to stay awake, the droning sameness just became too much at times. Whether you want to believe me or not, my personal belief system—Darwinian-advocate that I am—in no way played into my disappointment with this four-disc set either, because I was slobbering at the chance to see this documentary series. I'm all about exploring all the angles, but it does me no good when I have trouble absorbing the message because of the tedium of the delivery method. Image Transfer Review: Origin of Christianity is presented in its original 1.33:1 full-frame aspect as it was shown on French television. There is little variance in the image quality—which is good without being exceptional—with 95% of the series made up of talking head interviews set against black backgrounds. Fleshtones are presentable, appearing quite natural, and colors are pleasing and warm, as well. Audio Transfer Review: Audio is available in either English or French 2.0 stereo, and the clarity of all of the speaking voices is adequate and quite clean. There is little room or need for flashy audio histrionics here, and as such both tracks are more than serviceable. Extras Review: Not really anything in the way of supplements, but considering the in-depth scope of the material, there is very little left to fall as an extra, There is, however, an included booklet with appropriate biblical references, glossary and a timeline to act as a reference point. Each 48-minute episode is cut into a varying number of chapters, generally falling between six to eight per installment. Subtitles are available in either English or French. This 10-part French program is like a college classroom experience more than a standard documentary. What that means is that the presentation is on the remarkably dry side, but the material is rich, detailed and at times dizzying—especially for those with just a casual understanding of the subject.